Robosapien – Contexts for use. As you know I was raving about the Q4Technogies control software for Robosapien at Bett. They even won an award I discovered later. Within my AST work I’m hoping to run a Robosapien project as an alternative to Lego mindstorms, this year. That’s a work in progress and I’ll keep readers updated on that. 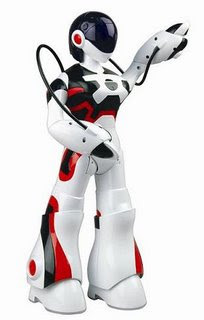 But I digress, I was lucky enough to visit the UK toy fair a few Saturdays ago and spoke to the inventor of Robosapien at the WowWee stand, Mark Tilden. A Canadian guy who was really interesting and knew and was excited himself about the work q4technoligies was doing. He said the company is trying to support them in every way they can. He also showed me new robots which should be compatible with the Go-Robo software. The Femisapien is cool, more on that later. I had a good discussion with him we were talking about contexts for using robotics. Most of think (myself included) that control is one of the last units which is truly discrete ICT. Normally the units involve control the robot, the software in some way. Get it to draw a picture, get it to dance etc... Can we get a context to pull control into other curriculum areas? He told me about work in the US and Canada where the robots where being used to act out plays, a really cool idea. Check out the videos later. This work has all been down without the Go-Robo software, using it now will just make this sort of work infinitely easier. So suddenly control ICT has a much wider cross-curricular context. We now have to think about scripting and voice acting. How the robots will move and gesture. You can even take it further into set design and costumes. It would be a great project and excellent use of control since is it’s embedded into the whole process. Great stuff. It would fit in nicely with some of the new drama and speaking and listening objectives of the new framework. Check out these videos below to get an idea of what you can do. Funny but a little rude.